I sat and watched as my students began to look around at each other, draw lines on their papers, and label certain places on the paper. 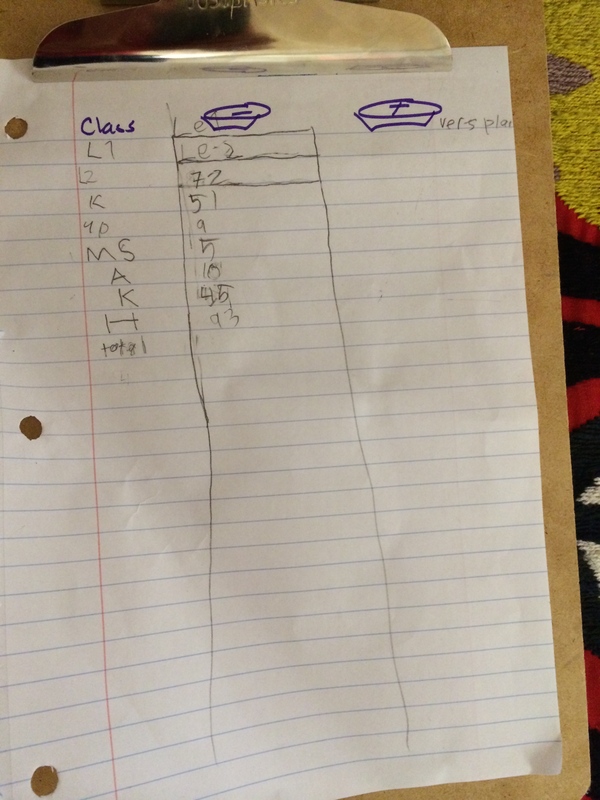 What I was trying to get them to do was make a two-column chart, in an effort to help them organize data for an experiment we were about to start. Yes, I could have taken the time to create a chart for them beforehand, placed some cute graphics on it, chosen a scientific font, and made copies so they could pristinely show their work on this consumable piece of paper. Likewise, I could have simply had them open up a Google Spreadsheet and input their data on a computer and then allow the computer to automatically create a series of graphs and charts. We certainly have access to the technology to do so, and it certainly would have been more efficient. B ut I chose to have them create the chart with their own two hands. I chose to have them create the chart from nothing, to rely on the simple materials around us, and to use their understanding of the world to organize themselves. And it was extremely intentional. There’s a misconception out there that we need lots of “things” to learn, that learning has to be expensive, and that going to a good school means going to a place where pretty products are manufactured daily. But that’s not the way you work. That’s not the way the world works. And that’s not the way kids should work. As teachers, we have the daunting task of helping our children make sense of the world. It’s like the building of a suspension bridge, with all of the world’s languages at one end and an individual child’s language at the other. In order to build that bridge, posts must be secured in the ground and then building must happen from both ends. And this means children must have a hand in it. 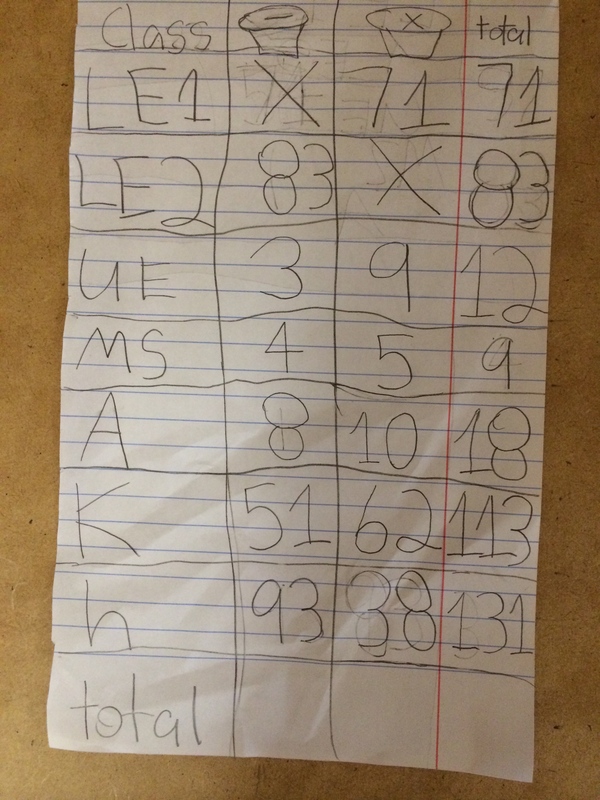 While the task of having children make their own two-column tables may seem laborious, rather disorganized, and extremely messy, the simple intention of it being student-created is not only easier for me, it’s better for them in countless ways. It allows them to own the task, to construct this language of data organization on their own, and it allows me to listen, so I may help to bridge the gap between their intuition –their language — and the language I’m trying to help them speak, which, in this case, was data organization and display. It helped them to build spatial awareness, understand partitioning, and interact with two-dimensional planes; not to mention, it built fine-motor skills. So, in order to help my children make sense of this data and this experiment, I started from the very beginning; I had them build something that technology could have very easily done for them, and as a result, I helped them build their knowledge of data collection through seemingly mundane and time-consuming tasks. But even more so, I authentically modeled that learning doesn’t have to come from a workbook or computer. Instead, learning comes through creation — not consumption.